In March, we asked animal-lovers from all across the country to share their rescue stories with the ASPCA. The response we received was overwhelming—nearly 2,200 of you submitted tales about animals whose lives you have touched—and after careful consideration, we are thrilled to share the three winning stories. Meet Pretzel, Cutter and Anna. I grew up with Dachshunds and I always knew I wanted another one, but I wanted it to be a rescue. One morning in April 2016, I woke up to a story about 25 Dachshunds that had been abandoned in three rusty cages on a pet sitter’s driveway in the Bronx, and I know this was our opportunity to help. A local rescue in our area, Save-A-Pet in Port Jefferson, New York, was involved in the rescue and hosted a ‘Wienerfest’ adoption event where I met Tater, a red miniature Dachshund. She was a little overweight, had bad teeth, a lump on her back and was petrified of her own shadow. I had been drawn to her sad picture on the website and it was love at first sight when I held her and knew she was coming home with me. We renamed her Pretzel, put her on a healthy diet, had her teeth cleaned and the cyst was removed (it was benign!). She is still a shy dog and is not a fan of strangers or new places, but we are working on it every day, and she is a completely different dog from the one we brought home. She loves her toys, napping on the couch and food! Pretzel is a love with a big personality and we are so happy to have her in our lives. 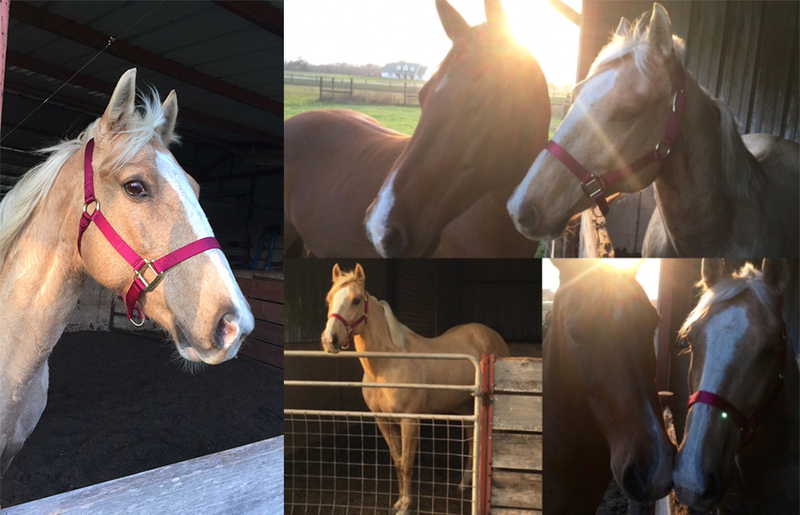 Cutter is a 17-year-old American Quarter Horse who was left behind by her family when they sold their property. The new owners were not “horse people,” and they wanted to ensure that Cutter got the best care. Cutter was 14 years old when she met the wonderful people of Crossfire Equine Rescue [in Mont Belvieu, Texas]. This horse rescue brings in horses, rehabs for as long as it takes, and then places them in their most perfect home. I had been looking for a rescue donkey to serve out the rest of its days as a companion to Double, the horse who has been part of my family for ten years, when I came across Cutter’s bio online. She had been at Crossfire for three years, waiting on the right home for her. She’s such a sweet girl, with a love of cuddles and a lot of spirit when you ride her. She needed an experienced rider and a gentle pasture buddy at her new home. Growing up training and riding my own horses, competing on my university’s equestrian team, and owning the most gentle gelding that ever lived, I had all of those ingredients. I quickly filled out an adoption application and scheduled a time to meet her. She was even sweeter than their description, and was just a sweet baby looking for love. She’s currently recovering from a tendon injury that she obtained from being a little too frisky in the pasture with all of the other Crossfire horses. I adopted her a week ago, and she and I are slowly working on rehabbing her back from her injury. Double is infatuated with her. When she is turned out, he follows her around the pasture like a puppy. She’s enjoying relaxing and spending quiet time with her new brother, and I’m enjoying the most perfect addition to our little family. We officially adopted Anna in 2013 after fostering her for a few months. 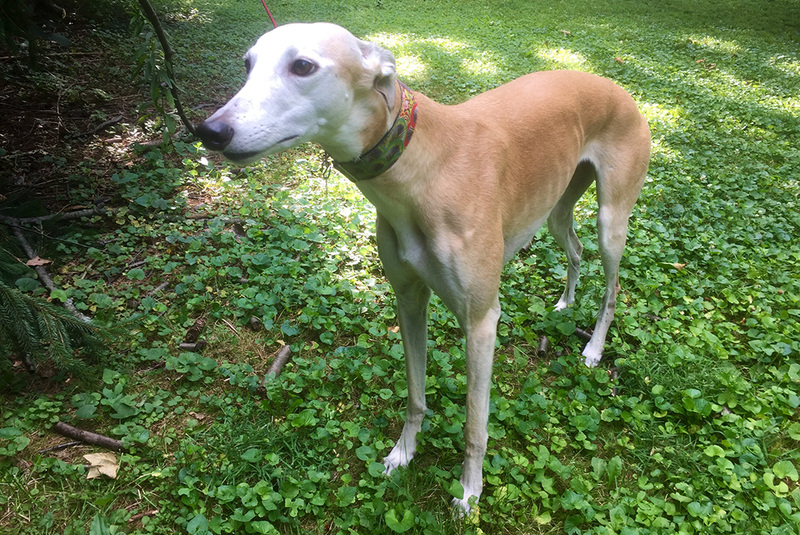 Anna is a Greyhound, and, through a local organization in Ohio, she was rescued from a life of abuse and certain death while being forced to race in Mobile, Alabama. Anna was two years old when she started racing and was given six months to prove herself—if she won frequently she would continue to race and eventually be bred. Unfortunately, Anna wasn't a very fast runner. So after those six months she faced death since she wasn't financially profitable. The organization we used travels to race tracks to rescue the slow racers from their planned death, and then they are briefly rehabilitated through the prison system where non-violent offenders are taught to care for and train them before they have the chance to be fostered or adopted. I traveled to a nearby women's penitentiary to meet about 20 greyhounds in February 2013 and fell in love with the little fawn, then named "Jax Indiana," with her funny ears and gorgeous eyes that looked like they had just been lined with black eyeliner. She went home with me that very same day to meet my husband and her new big brother, Spartacus the black cat. Anna didn't come home fully rehabilitated—physically or emotionally. She had small chunks taken out of the skin along her back from being repeatedly whipped, and the sides of her thin little body were healing from chemical burns too. After her hair started to grow back on her sides and the top line of her spine, she looked healthy. Her disposition is so kind and beautiful but she initially had so much separation anxiety that it was heartbreaking to leave her at home. She would frequently have accidents inside the house when left alone and she would cry and shake, even with her bed, treats and toys. We tried crate training her until one day we came home to a bloody mess after she used her nose to bend the bars on the crate to try to get out. I didn't know that her life had been confined to a crate; that's where she ate, slept and went to the bathroom on the race track. We immediately got rid of the crate and tried to take her with us everywhere we went, and when we both were at work we would usually have my little brother come watch her. We also tried to teach her that big men in baseball hats were NOT going to hurt her ever again. We changed her name to “Anna” because it fit her better, plus being called “Indiana” was already pretty close. Today Anna is much calmer. Thunderstorms and loud noises don't bother her anymore, big men in baseball hats are welcome to greet and pet her, and she loves visitors and hasn't met anyone she hasn't liked in quite a while! Physically, the only scars or reminders of her former life are the tattoos inside her ears with her birthdate in one ear and her racing identification number in the other. Our four-year-old nephew has autism and Anna is so kind and patient with him—she doesn't mind it when he pokes her in the eye or when he used to pull her ears—and she's been a calming influence for him. The bond they have is beautiful. Our nephew is non-verbal but he enjoys lying down with her, placing his head on her side, petting her gently and saying, "Awwwww." She obviously makes a comfortable pillow for him too! I can't imagine life without Anna over four years later. I don't think we rescued her, I think we were blessed by her and now we are just honored to be her parents. We look forward to the day when we can add more rescued racers and senior Greys to our family! Choosing just three stories was incredibly difficult, as each and every submission we received was an inspiring look at just how dedicated our fans and supporters are to making a difference in animals’ lives. We thank everyone for sharing their stories and photos, and remind you all to never stop rescuing!